There is nothing better than a lonnnng soak in the bath, a couple of candles, some music maybe? Everyone’s preference is different but there is one thing for sure and that’s that the addition of a Bath Blaster from Bomb Cosmetics is sure to make any relaxing bath into a bathing experience of pure bliss. 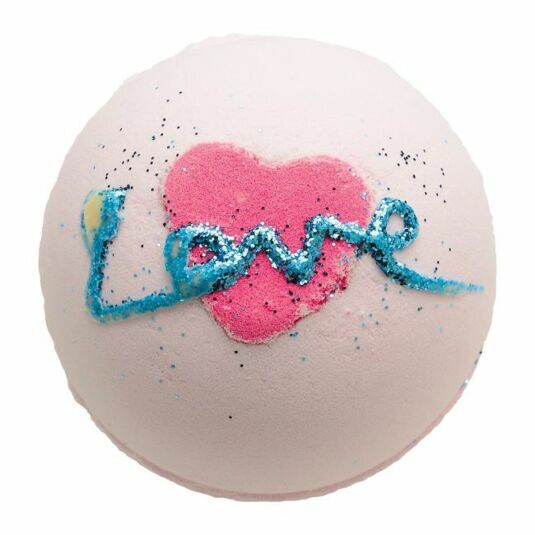 This handmade All You Need Is Love Bath Bomb contains rose and ylang ylang pure essential oils which are great for relieving negative emotions and are also known for their aphrodisiac properties! Light pink in colour and decorated with a pink heart with the word ‘Love’ written with blue glitter, this would make a lovely gift for a friend or loved one. Drop your Bath Bomb in to a bath of warm water and watch as it fizzes, releasing its perfume and essential oils, while the Bicarbonate of Soda softens the water. Sugary notes are combined with a fruity Strawberry and Raspberry fragrance mellowed by elements of edible parma violet and completed by delicate creamy caramel.